Sorry I’ve been a bit quiet on the Our Society front lately. This post is about #twicket, which is one of the reasons I haven’t been here much lately. I am not going to tell the full story of #twicket, as I have documented it all, in quite some detail here http://wp.me/ppLRZ-dH. If you don’t know what #twicket is, then the rest of this post may not make much sense to you, so I suggest you read that post first, or listen to my interview about it on Radio New Zealand http://wp.me/ppLRZ-fc. I want to talk about what #twicket has taught me about community and social capital. The first point is about serendipity. 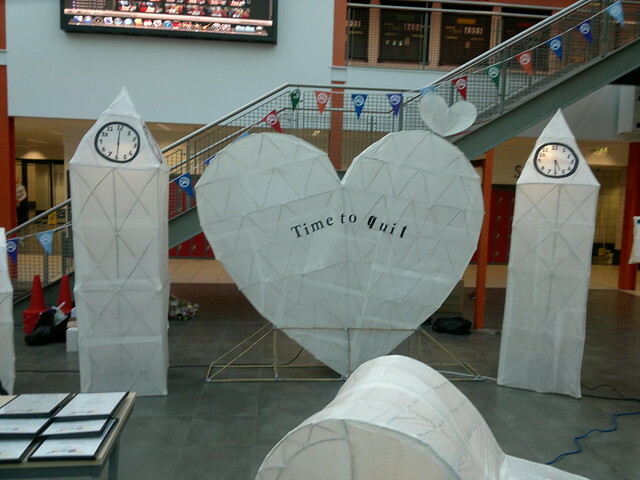 I put together two random tweets and built something which became a lot bigger than I had ever envisaged. I think this illustrates how the internet is increasingly being used help people find common cause with others, from those seeking social change in North Africa, to those wanting to discuss the intricacies of 1970’s prog rock lyrics. And, in defiance of the tabloid newspaper headlines, I believe we are finding new ways of using online interactions to reinforce, enhance and develop face-to-face relationships, rather than replacing them. I think Our Society is a good illustration of this factor, keeping the conversations going in between face-to-face events. From those random beginnings, #twicket quickly built a community of people interested in pushing back the boundaries of the web, rural broadband, content creation, and cricket. And this proved to be a much bigger community than I had ever imagined. Not all of them were equally interested in each of the elements, but there were enough people interested in their intersection, and interested to different degrees in bits of the package, to make the whole thing a major success. And then there were people who said to me “I hate cricket, but I’m going to be watching this match”. 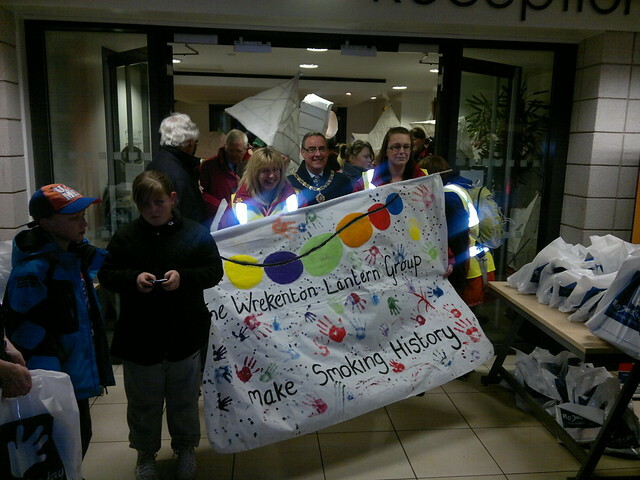 A key element in the success of #twicket was that it was built around a fun activity. I hope those people who have been championing the cause of rural broadband for years do not mind too much that #twicket seemed to generate more interest in 15 days than much of their campaigning has done in years; but, I think the point is that putting the cricket match up front made people turn their heads in my direction and I then had a platform from which to make some serious points about countryside connectivity, which I was able to do on the regional BBC TV News, Radio Lancashire, the Guardian Technology Blog, the Metro Newspaper, and Radio New Zealand. It was a bit frustrating that TalkSport and BBC London both chose to focus exclusively on the cricket match and to interview players involved, which was great for them, but wasted the opportunity to make some of the main points to other audiences. And so to my final point, about social capital. I’ve been grappling with this one since the whole thing started, but I was blown away by the people who were prepared to chip in and offer time and resources to help make the project happen. I suppose you could call this cashing in social capital. I am extremely grateful to everyone who helped, whether they were in Wray on the day making the event happen technically, or writing Wikipedia entries, or just re-tweeting the latest news as events unfolded. I hope all those who helped got as much of a buzz out of it as I did, and I sincerely hope that those who donated time and resources to the cause get a positive business outcome from it. Some of the people who helped out in big ways I had never met before #twicket began, so I think that does show that Twitter friendships can become real friendships and that social media can generate social capital as much as helping people in “real life”. I think there are important lessons here for Our Society, Big Society, Community Organising, and Localism. We must mix online and offline interactions and activism if we are to include everyone. Online work can fill in the gaps between real life actions, maintain the conversation and embrace those not able, because of time or access issues, to take part in physical interactions. And we should not dismiss online relationships as ephemeral as they can be just as important, if perhaps in different ways, to the friendships we experience in the offline world. How true, Lorna, I wish everyone could see that. I think Social Media Surgeries, as you well know, are a good start in the direction you are talking about. It always disappoints me when I help someone set up a new account (Twitter or whatever) at an SMS and then I never see them use it. As I often say, the technicalities can be relatively easy to grapple with, it’s the voice and the conversation that can be more difficult. I also, often advise people to treat Twitter like a new group they have joined. Initially they might be reluctant to say much, but they can listen to the conversation, and, eventually, find the confidence to join in. This is also why I take every opportunity to talk to the mainstream media about social media. This helps to counter the negative perceptions that the dinosaur media likes to put about as they feel threatened by the new tools. This does mean, however, that many people approach social media with their heads full of these negative perceptions. Another key barrier I come across all the time is people who work in organisations where all social media is blocked. This adds another barrier, as it gives them the idea that social media is not a serious professional tool, and using it is somehow doing something “naughty”. I agree with you John, there’s great learning here. I’ve only been using online social tools for a year, but by learning from generous people like you I have unexpectedly made amazing connections which have had a hugely positive impact on every aspect of my work. I wonder if Our Society could look at ways to support people who are interested, or dipping their toe in, but haven’t quite figured out how to develop new online relationships? A few recent (offline) discussions have helped me to understand a couple of things which can result in people listening but remaining unsure how to give online. The first is a lack of introductions/welcome – for example on twitter. I was warmly welcomed by you and others thanks to a sort of invisible introduction by @sospot. This made sending a few tweets much easier, and helped me to feel that I was in a virtual room full of the sort of people I would really get on with. I think some folk join twitter but then hesitate to join the conversation. The more of us that can either go over and say ‘hi’ or provide them with something to give them the confidence to do this the better. Another barrier (in my view) is the belief people have that online they need to keep separate their job or voluntary role from the rest of who they are as a human being. This feels a potentially huge block to social capital development online, and especially when this is exacerbated by people who seek to behave as an organisation online. Organisations don’t make social capital, people do – so can we help people to be themselves online? So true. One of the ‘broader picture’ themes that is emerging out of ‘new social’ is that both new communities of interest are being created, but also adds new impetus for existing communities to reconnect – and the growth of hyperlocal is testament to this. We all know how the ‘entropy’ of 20th Century living fractured ‘community,’ and particularly the diminished returns on social capital investment – ie being neighbourly/citizenly/etc. I’d be interested in your thoughts on the difference between serendipity-based self-organisation and active mobilisation of community – is there a dichotomy here, or do we need manifold approaches? spot on John. I invited many government ‘types’ to the event. Only the one you invited made it. They missed so much. I don’t know if they watched the archived stream, but this event proved that big society is alive and well amongst the grassroots. Shame the ones who are in charge of the agenda don’t seem to understand how it all works, either in the analogue or digital world. Twicket proved more than one point that day. 1. that rural areas really do need decent internet connections like Wray. 2. that friendships made on twitter/fb etc end up making friends in real life. 3. that using social media new communities can JFDI and make even more (and bigger) things happen. 4. we don’t need funding or government intervention (but there is a limit to how much we can do without it). 5. people power can and should be harnessed to do more good, and the only way to do it is from the bottom up, not the top down way the government is trying to do it. This is the story of 15 days in April. 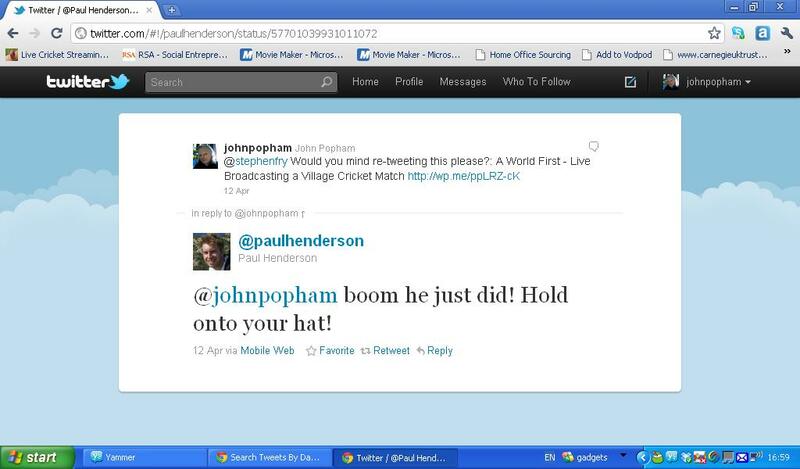 Two random tweets on a Sunday afternoon led, 15 days later, to me standing getting sunburnt in a field, while around 4,500 people watched and listened to a village cricket match online. Twiter is known as the “Serendipity Engine” meaning that it facilitates interesting and useful exchanges and events born from initially random connections and conversations. The process that led to #twicket is a classical case study in serendipity. It was a quiet Sunday late afternoon, and in fact, what I was mainly doing (along with some untypically male multi-tasking) was ironing my son’s school shirts. During a quick break, I had a glance at my twitter stream on my phone. It was then that I noticed two unconnected tweets. 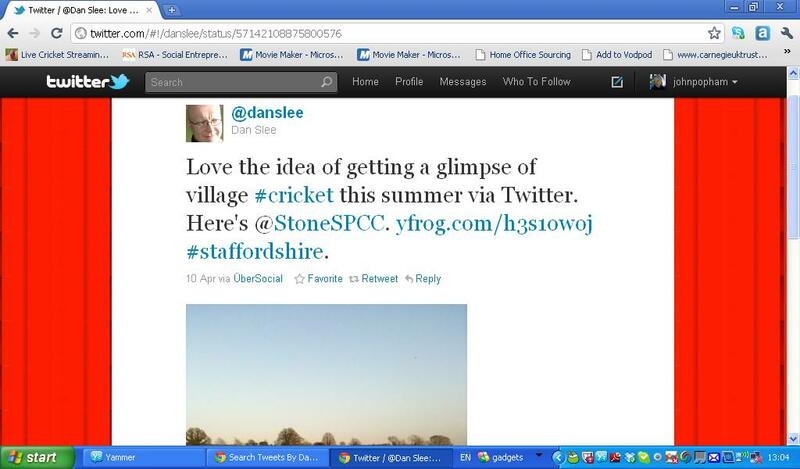 The first (above) was from Dan Slee, who was welcoming the fact that his local village cricket club was on twitter and saying how he was looking forward to following their progress. 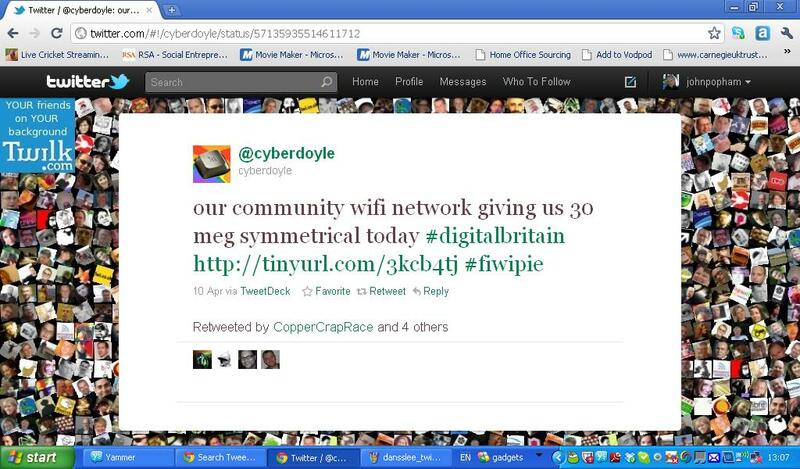 The other tweet (below) was from Chris Conder (otherwise known as @cyberdoyle) who was uploading evidence of the fast speeds she was getting from the new fibre network recently installed in her Lancashire village of Wray by Lancaster University. 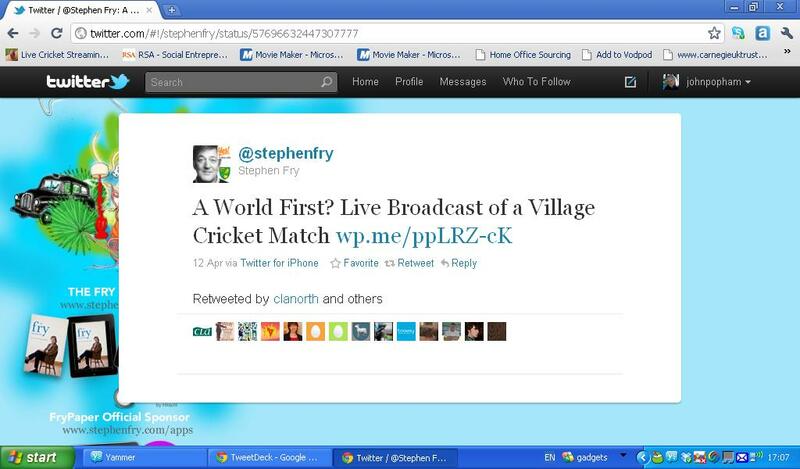 I’m not sure how long it took me to make a connection between these two tweets, but it wasn’t long before the thought crossed my mind that, with an internet connection like that available in Wray, it would be perfectly possible to stream live video of a cricket match to the world. These thoughts churning around in my head and leading to a purpose, brought together a number of interests and passions of mine. The spur was undoubtedly cricket, a passion of mine since childhood. The second was rural broadband, even though I live in an urban area, I have known a lot of people involved in the campaign to improve broadband in rural areas for a number of years, and I have done various pieces of work to help out where I can, including helping to create the “book plus” describing the installation of the first UK rural 100Mbps Fibre to the Home network in Ashby de la Launde in Lincolnshire. The third point was my belief that we need to push hard for symmetrical broadband to cater for the growing trend for people to create their own content, and the move away from passive consumption of media. And the final push, from my point of view, was my passionate belief in social media and my quest to show people how easy it can be to share content and open up their events and discussions to the world, particularly via live video and audio streaming. A few days earlier, I had suggested to Chris Conder that we should work out an event when we could demonstrate the power of Wray’s new connection. Chris and other volunteers in Wray have worked hard with Lancaster University to install and utlise their fast broadband network. Wray is one of only three rural villages in the UK (let me know if there are any others) with the sort of internet connectivity which would allow video streaming of local events, the others being the aforementioned Ashby de la Launde, and Great Asby in Cumbria. Not only is Wray a very connected village (compared with most of the rest of the UK in any case) it also has access to symmetrical connectivity, something which is a very rare commodity in this country. As the thoughts coalesced in my mind, the idea gradually emerged which would allow the testing and demonstration of all four of the factors I was considering. 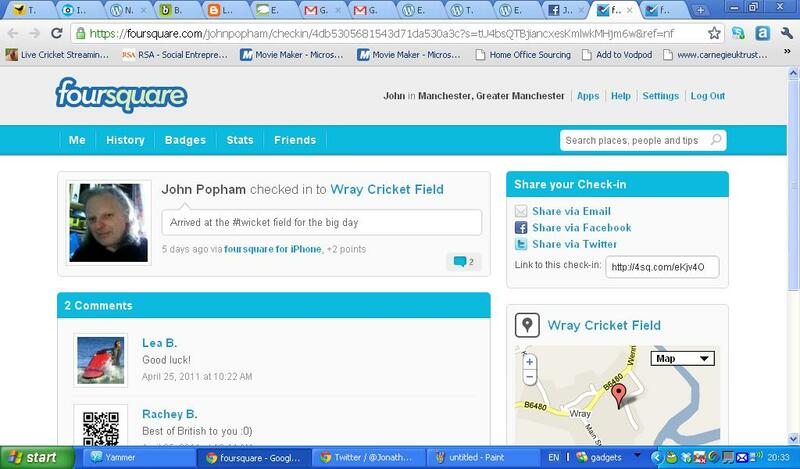 I replied to Dan that I thought it might be possible to live video stream a village cricket match if the connectivity was good enough, and then placed a Skype call to Chris, and my first question was whether Wray had a village cricket team. Her reply was that the village does not have a club as such, but it has an informal team which plays once or twice a year against “The Rest of the World” (actually a team made up of people from the surrounding villages), the next occasion being Easter Monday. Easter Monday was 15 days away, not the sort of timescale I was thinking of, but I don’t like to shirk a challenge. So I sat down and wrote the blog post which put the idea out into the world and wondered what the reaction would be. 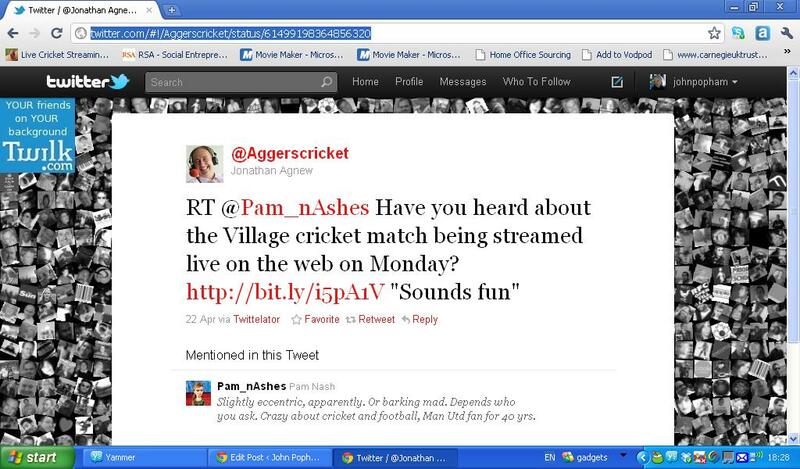 It’s probably apposite to mention how I had originally intended to approach the live video stream of the cricket match. One of the things I do in my work as a Social Media Surgeon is low cost live video streaming of conferences and events (example here). I had intended to take the same approach to the match which later became known as the #twicket match. Basically, my intention was to use the Livestream platform to stream from two webcams and a mobile phone placed at different parts of the field. I do this kind of thing a lot, and it works well for a lot of events, I was, however, a bit concerned about how it might work outdoors and where most of the action is a considerable distant away. Nevertheless, I was experienced in low-cost video streaming, I knew it could be done, and was determined to demonstrate it on the cricket field in Wray. Over the next 24 hours, the idea started to take off. It generated a lot more traffic on twitter than I had expected, and I started to get contact from a number of unexpected sources. One of these was BBC cricket commentator Alison Mitchell, whose imagination seemed to be sparked by the idea, and who entered into a dialogue with me about it, initially on Twitter and then by email. This made me think this might be an idea which could be much bigger than I had originally believed. Interest built gradually during the Monday. I had a couple of tries at interesting Stephen Fry in it, as it is well know that, with 2.5 million twitter followers, anything Stephen tweets about gets a lot of attention. I also knew two other facts about Stephen Fry which were relevant in this instance, one being that he is a keen cricket follower, and the other being that he is a close friend of BBC cricket correspondent Jonathan Agnew from their school days together. On the Tuesday morning, I woke up early and went to the computer. It was about 6am, and I noticed that Stephen Fry was tweeting that he was on his way to catch an early flight. I thought this would be a good time to try to attract his attention as there would not be too many other people tweeting at that time. So, I sent him a Direct Message asking him to tweet about the plan. Nothing else of note happened that morning before I went to drive my kids to school. 45 minutes or so in the car meant I was oblivious to anything that had happened on Twitter, until I got home and sat down at the laptop. The first thing I saw was the tweet below from Paul Henderson, and it took me some time to work out to what he was referring. That day (less than 36 hours after I had the idea) the whole thing escalated dramatically. I had more than 5,500 reads of the original blog post on that day, and it was featured by wordpress.com as the 50th most read blogpost in the world, and my blog was further featured as the fastest growing blog in the world. And the offers of support started to come in. The one I was most grateful for was that from Aquila TV / Event with Me who offered not only to step in and take care of all the technical aspects of the broadcast, but also build the web portal too. Now, one of my original objectives had been to showcase my low cost live streaming methodology, but, given the widespread attention the event was attracting, I took the decision that, if experienced professional broadcasting expertise was on offer, I should take advantage of it, as it had become important that the quality of the viewing experience should be maximised. Also, around this time, Paul Hadley came up with the idea of using the hashtag #twicket. Interest continued to build, a number of media outlets picked it up, including Sarah Hartley in the Guardian’s Technology Blog and Sarah Marshall in journalism.co.uk. and a number of people started to ask me about sponsorship opportunities. The Country Land and Business Association (CLA) weighed in as first sponsors, and they were joined, later, by Talk About Local. It has to be said, though, that, despite considerable interest in sponsorship, including, at one point by a major media company, little actually materialised, and I think the lesson from that is that it needs a much longer lead-in time to turn sponsorship interest into firm action. On the Friday of that week, as #twicket hit the Metro national newpaper, I took advantage of a scheduled visit to hook up with Nick Booth in Birmingham to go to Aquila TV’s offices and discuss the technical aspects with Nat Higginbottom. While in Birmingham, I received an interesting approach from PayPal, who wanted to use the the #twicket event to test out a new online payment mechanism. I am grateful for PayPal’s help and support in building a donations system which was incorporated into the portal at http//www.twicket.info, and I am further grateful to everyone who donated during the match. 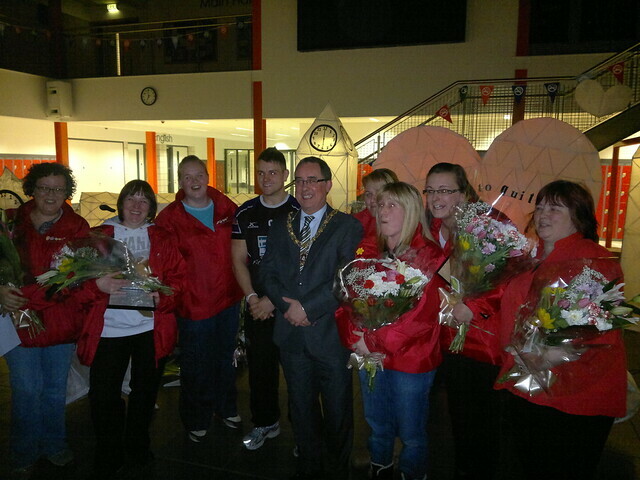 Again, however, it has to be said that the funds raised this way were marginal. The following week was spent following up sponsorship opportunities (most of which failed to materialise), and helping Event with Me build the web portal (oh, in-between the day job, that is). All this involved a fairly bizarre mix of discussing internet upload speeds, whether the players had cricket whites, and putting together a sponsorship package. On the Tuesday, it occurred to me that we needed a way of ensuring that people could listen to the event if they weren’t able to sit in front of a computer and watch it, and that this might be a particularly important factor if Easter Monday turned out to be a hot day and people wanted to be out and about. I therefore contacted Bill Best of the Community Media Association who kindly circulated a request to all their members appealing for a community radio station to join us on the day and provide live commentary. Within two hours, I received a phone call from Prashant Singh of Radio Youthology , a station based at Birmingham City University, and I was very happy to have them on board. I spent far too much time on Sunday 24th April worrying about the weather forecast. Most of Britain had experienced an unseasonable heatwave for a week or so, and the forecast was that this was due to break on the day of the #twicket match with cooler temperatures, widespread cloud, and a slight threat of rain. Despite assurances from the cricketers that they would play unless the rain was particularly heavy, the one thing I really feared was heavy rain that would cause the whole thing to be called off. There followed three hours of rushing around, erecting gazebos, putting up tables, moving chairs, sourcing power leads, welcoming people, and wondering if we would ever be ready. Minor panics included not having a gazebo or table for Radio Youthology, but these omissions were fairly soon rectified. The more major panic was that the main internet connection, supplied courtesy of the cable slung across the main road, wasn’t working. This was a real cause for concern, except that we did have, as back up, the connection which I had used for the test the previous week, which had proved problematic. So, we did our test runs off the back up connection while Chris Conder frantically ran around the village trying to find the location of the break in the main cable. As we worked on getting everything set up, I received a message to call the BBC in Manchester, and arranged to do an interview with them for the North West Tonight programme in the interval between innings of the cricket match. Also at this time, Mike Rawlins arrived and started to erect his 50ft tall camera rig which gave us some amazing aerial shots of the action later in the day (see them here). All this time, Chris continued to work away to get the main internet connection working. As it turned out, when she eventually did get it working it proved to offer slower speeds than the back up connection we were already using. We decided therefore, to proceed using the backup connection, and it didn’t let us down. As start time grew nearer, the players began to arrive, some of them looking a bit bemused by the amount of technical equipment that had sprung up around the edges of their local school field. I had to admit that something which had started off with the intention of being a low tech demonstration event had mushroomed somewhat and the cameras and mixing desks provided a different perspective on the whole thing. While local media student Marnie Clark rounded up the cricketers to take their photographs, and the guys from Radio Youthology compiled team sheets, Nat and Julia fired up the live stream and we went live to world, initially, mainly with shots of grass growing and birds tweeting. As even this bit of the coverage attracted 50 viewers straight away, we were off and running. Then I grabbed the microphone, introduced the coverage, and rounded up the captains and umpire to do the toss live on the video stream (a confession to make here, they had already done it once off camera, and I had to persuade them to re-create the experience for the online viewers). Then another last minute panic as we struggled to locate local resident Brenda Mickle who had agreed to act as commentator. But Brenda appeared and took her seat just as the first ball was about to be bowled and we were off. 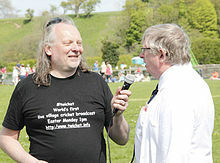 As the Rest of the World innings unfolded, we saw a number of world firsts, including the world’s first cricket catch live on the internet from an English village by Wray’s Phil Denby, the first yellow cards in a broadcast cricket match of any kind, brandished by umpire John Marshall, and the highest score ever in a live broadcast village cricket match of 20 (there was a cap on scores so any player who reached 20 had to retire). We also saw the first six which smacked against the tripod of one of Radio Youthology’s still cameras, and a four which rapped the exhaust pipe of Chris Conder’s car. Councillor Simon Cooke, who had travelled especially for the game from Cullingworth in Bradford, kindly took on some of the commentating duties which allowed me to roam around for a while taking in some of the atmosphere, watch the viewing figures creeping up, and monitor the twitter stream. It was while scrolling through the tweets that I began to realise the phenomenon we were creating in the form of the growing fan club attracted by Brenda’s commentary. I returned to the commentary position to tell Simon he had to give the microphone back to Brenda, her audience were missing her. Nat then connected a second microphone so we were able to have Brenda permanently on mic. During the second innings we also had the debut of “Brendacam” allowing her adoring public to see her in action, appearing at one point as an inset in the corner of the screen. We even had a “streaker” as a fifteen foot tall “Aunt Sally” scarecrow took to the field to remind everyone of the Scarecrow Festival taking place in Wray at the time. As the Rest of the World stuttered towards what most of us believed to be a below par score of 69 (initially reported as 65, but later revised by the scorer), the viewing figures rocketed beyond our wildest expectations. As so to the Wray innings. As I talked to Sarah Hartley on the phone for her latest Guardian Tech Blog entry, it became evident both that Wray were going to knock off the 70 they needed to win pretty quickly, and that the Brenda phenomenon was growing. It was perhaps fitting that the winning runs were hit by the vicar’s son, Matt Cannon, with a massive 6. But the entertainment didn’t end there. My first post-match interview was with Brenda herself. At this stage, and since, Brenda has been somewhat disbelieving of her popularity. As we asked the viewers to stay with us for the Tug-o-War to follow, everybody’s attention was drawn to a young boy doing an amazing breakdance routine to the music eminating from the Radio Youthology speakers. And so, the day’s live online entertainment concluded with the Tug-o-War won 2-1 by The Rest of the World who went a little way to avenging their comprehensive drubbing in the cricket match. And I will be on Radio New Zealand on May 6th at 9:35am UK time, 8:35pm New Zealand time. The Radio New Zealand approach is just one example of overseas interest in #twicket. People watched all over the world, this exchange on a Pakistani cricket forum is another example. I saw a tweet from someone in Manilla in the Phillipines who was struggling to watch because their internet connection was not up to it. This is one of the supreme ironies of what we were able to do. There we were on a field in a rural English village sending out content which many people in cities struggled to view because they didn’t have good enough connectivity. The viewing figures for the live video stream peaked at 2730. That was the largest number watching at any one time, so it is likely that many more people actually watched than that. 1780 people listened to Radio Youthology’s live audio commentary. That was their highest listening figure ever. But the impact of #twicket has gone much further than those figures suggest. Stephen Fry’s tweet went to 2.5 million followers; I don’t know how many people read The Guardian’s Tech Blog, but it ran two articles. The Metro Newspaper is given away free, mainly on public transport, and claims a circulation of 1.35 million, including the student couple opposite me on the Manchester to Birmingham train who were in great danger of passing over the #twicket article until I pointed it out to them. The listenerships of BBC Radio Lancashire, TalkSport and BBC London all know about it, as will the audience of Radio New Zealand very soon [the Radio New Zealand interview is now here]. And the viewers of BBC North West Tonight will have seen it on a fairly slow news day on Easter Monday. I am confident it has successfully highlighted all of those issues, but it can only be a step in on-going campaigns. I fully intend to run more events like this, but next time with a longer lead-in and with sponsorship which at least covers everyone’s costs. There are some unintended consequences of all this too. One might be the rise to stardom of both Brenda and the amazing breakdance kid. Another is the mixing of cultures and backgrounds that happened on the day. Radio Youthology, for instance, works mainly with young people from inner city backgrounds, and they reported what benefits it brought to their team to be able to get out into the countryside and experience village practices and culture. And I hope the people of Wray might have learned something from them in return. I am now exploring with Radio Youthology the potential to do more of this sort of work which mixes cultures and experiences and brings the country and the city together. I think there are some important lessons to be learned here. 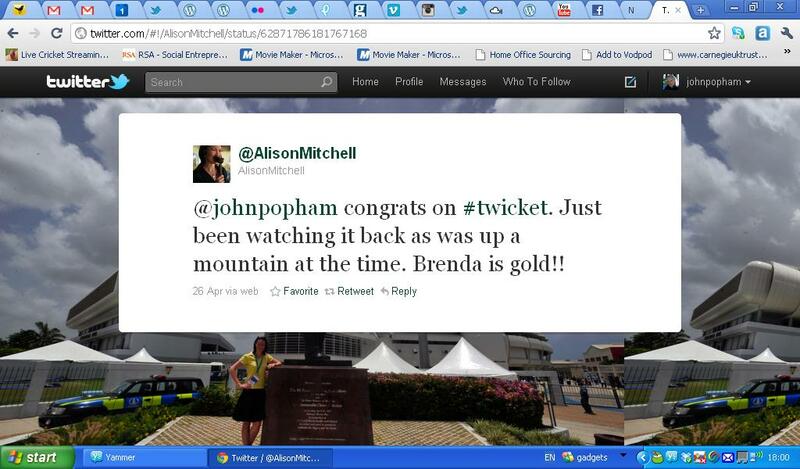 I am profoundly grateful for all the nice things that people have said, both to my face, and online about #twicket. It seems insidious to single anyone out, but I thought this blog post by Janet Davis was really lovely and I’d like you to read it too. And I’d like to thank everybody who gave their time and resources to make all this happen, I really hope you all get something out of it. And so, what next? Well I’ve already written elsewhere about the long term objectives https://johnpopham.wordpress.com/2011/04/21/sponsorship-needed-for-twicket/ The truth is that the event didn’t raise much in sponsorship, so those longer term objectives may have to wait, but, if you’re reading this, and have access to finance that might be invested in such objectives, please get in touch. I’ve got plans for another event. Possibly a beach cricket tournament on Blackpool Beach. There’s a lot of talking to be done before that could happen, and it would need major sponsorship, but I want to do it. Some of my shorter term objectives relate to continuing to spread the word about #twicket and what it means. I am keen to speak at conferences and other events and on other media outlets about this. So, please get in touch if you’d like me to contribute to your event or programme. If you’ve stuck with this mammoth post to the end, thank you. I am not sure when I will come down from the high I’ve experienced as a result of #twicket, but I’d better get planning the next event just in case.